Hello, please note that we will not be having a meeting this coming Monday. Next meeting will be on Monday, April 10 at 6pm at the RCA Hall pub downstairs. Thank you. Hello, please note we have changed our meeting days to every second Monday from 6-7pm. Next meeting will be February 27. See future dates in the right column of this website. Unfortunately, we are having issues with the times and meetings are NOT from 5-6pm, but from 6-7pm. Thank you and our apologies for the confusion. Highest Priorities are Alberta Canada 150,Tree to Nature, Grassroots and Soul of City. Heike to complete Alberta Canada 150. LOC update – out of our hands. Waiting for City and lawyers to complete, approve and provide to us. Robert Dickenson & Vivian Cantin are our City contacts. Garden Building start – Lisa, Heike and Lindsay, Adrian and Luke from reGenerate to hold initial meeting. Planning to build ¾ of garden as laid out in reGenerate’s plan. Looking to include PVC piping, stones and mulch to lay down under walkways and Meeting time set for Feb. 1 at 3:30pm. Water Access at site – City still needs to install the irrigation lines and spiggot. Calgary Attendance Center – we booked 12 days with this organization in May, they will be providing man power to help with building of beds,sod removal, benches, compost and storage bins, garden signage, digging of swale and various other duties involved. Tetra Society could help build fully accessible beds etc, as we are thriving to be a garden accessible to people with disabilities as well. Society is volunteer run and Sam will contact them to see how they work and what they would need. To be held in early part of June, date to be set shortly. Sam to talk to Christy at BGCC Aboriginal Yough Program re. their group coming to ceremony. Once we have date set, we can start inviting groups such as neighbouring gardens, schools, Calhort, RCG Members, Renfrew Residents, Aldermen and office etc. etc. Advertising – posters, Renfrew Reflections, Calhort, Tiwtter, Blog, Facebook, Sandwich Boards and more. Heike to look after posters, Reflections, FB, Sandwich Boards. RCA Casino – June 8 & 9th – Asking committee members and future gardeners/volunteers to come out and help. 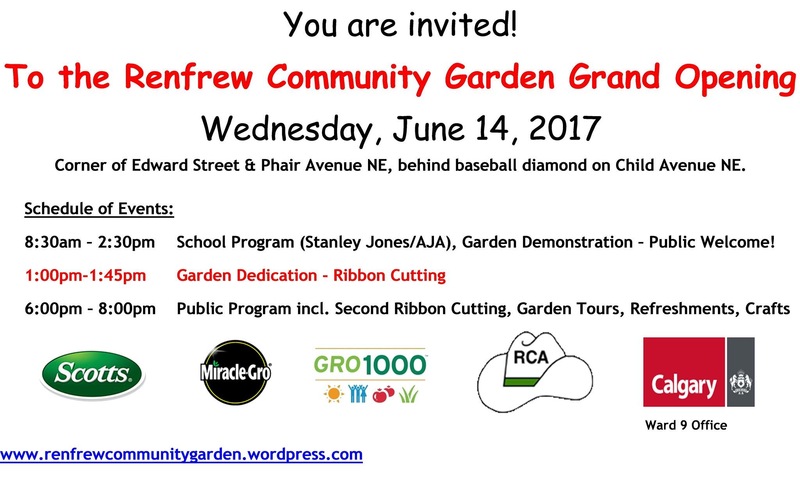 Stanely Jones Historical Garden Weeding – review commitment to garden, formalize agreement with school and create a schedule for the summer. Use sandwich boards for advertising/information during weeding sessions, passerbys will know what we are doing. Lisa & I represented the RCA community garden at our community’s Stampede Breakfast on Saturday, July 9 this year. It was great to chat with some very interested folks from the neighbourhood. Thanks all for coming out!